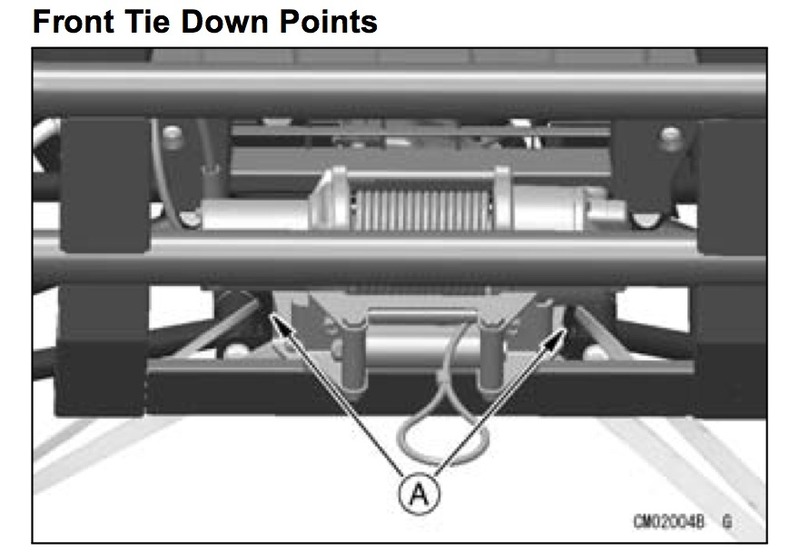 Does anyone have a better image or description of the front tie down points. I've looked at the owners manual, it's not helpful (to me anyway). My dealer said they receive their Mules shipped via strapped at the front bumper, and at the 2 safety-chain anchor points at the receiver. I have tied down my Pro FXR a thousand times and 999 times the tie downs pop off about 50 miles down the road. I have never had any one item throw tie downs off like this Mule has. I ordered an E Track setup for the rear tires that should be here tomorrow. I'm hoping this keeps the Mule to the trailer. I had the exact same problem with my ties coming off. So I switched to Mac's safety ratchet straps w/axle straps. Love them. Can also get them on amazon. Its best to use the 2"+ straps and go from side to side. Don't just hook to the ends where gravity will let it fall off if it gets slack. If you have to hold a bind on the strap or the hook falls off its hooked wrong. There are also straps that have a foot or two of chain on the end and a clevis. You can make a loop with the chain on the trailer and use the clevis to secure it. I always take a piece of white sash cord and tie from the bumper to to top rail of the trailer. No matter what happens with the straps you can usually always depend on the rope. All 1" straps are horrible. With a little time.. even if hooked right.. they can just pop at random. I just purchased a new Pro FXR and was looking at the manual and wondering if I would get it tied down correctly. Crappy pic in the manual. Still not sure where to strap it. No other UTV has thrown tie downs like my FXR. Now with the E-Track, it never comes off.